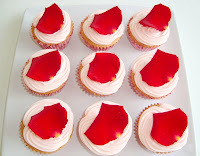 Today I baked this weeks poll winner: Rose Cupcakes. I've been waiting impatiently to try out the rose syrup. 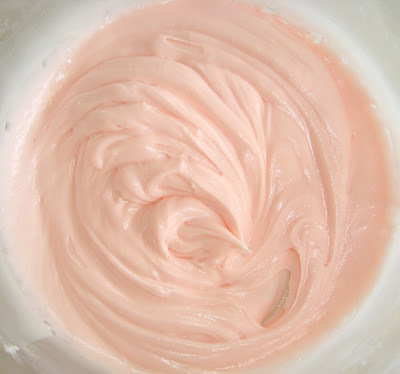 A reader suggested that rose syrup goes well with milk and it does! So besides rose milk, this is my first baked recipe with rose syrup. 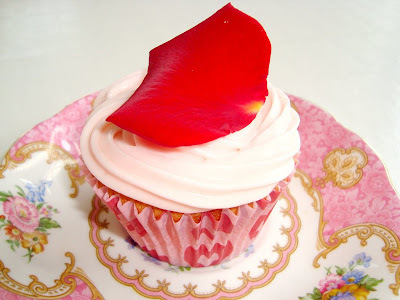 Taking a note from Pierre Hermé, I added a real rose petal to every cupcakes and it looked fantastic! Very elegant. Perfect for high tea or a fancy dessert. Now these cupcakes don't just look good, they taste amazing as well. Every bite takes you to Paris and back. I adore ♥ them! These go in my top 5 of favorite cupcakes of all time. Rating: 5 out of 5. - With an electric mixer on medium-high speed, cream butter and sugar until pale and fluffy. Add eggs, one at a time, beating until each is incorporated, scraping down sides of bowl as needed. Beat in vanilla and rose syrup. Reduce speed to low. Add flour mixture in three batches, alternating with two additions of milk, and beating until combined after each. - Sift the confectionars's sugar into a medium bowl. - Add the softened butter, milk, vanilla, rose syrup and food coloring. 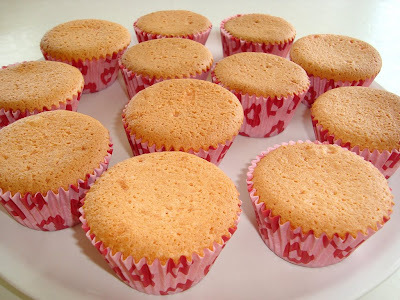 The batter in the cupcake liners. 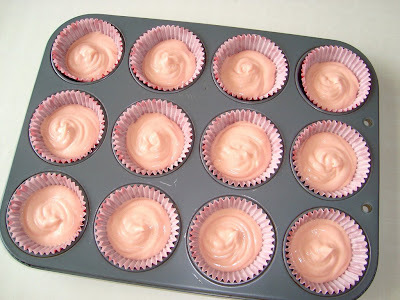 The batter isn't pink because of the rose syrup; I added 3 drops of red food coloring. I think it adds a lovely touch. 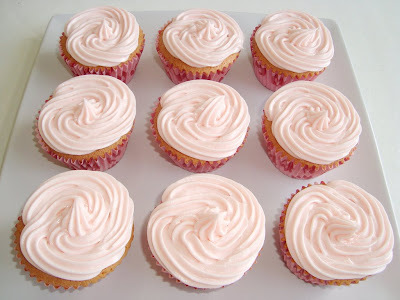 Rose buttercream frosting!!! Tastes and smells heavenly. They kinda look like roses already. 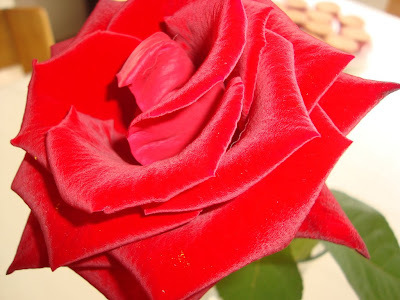 I bought one velvet rose for garnish. Et voila! 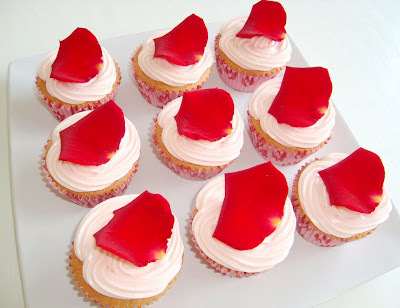 Gorgeous, gorgeous rose cupcakes. They taste as divine as they look! i sound like a broken record when i comment on here but... you did an amazing job! i'm going to make these for my anniversary with my boyfriend. which gives me less than 1 month to hunt down the rose syrup! I can't wait to try out these cupcakes! what an interesting recipe. these look so nice ! These would be so pretty for a tea party. Definitely going to have to try them. They certainly look perfect for a tea party! These cupcakes look incredible. The rose petal on top adds such a special touch. I just found your blog and I love it. I will be back to get some recipes. I love your plate (last pic) where did you get them..they so sweet and vintage. I love everything vintage. Love your blog, you are such a good baker and have such creative mind. Thank you so much Dee!! The last plate is actually a tea saucer - family heirloom! I should bake them again sometime! i can't wait to make these! Thank you so much! This is such a delicious recipe! I made the rose and then changed the syrup to lavender and made lavender cupcakes. So moist and scrumptious! Question, I halved the frosting and it is somewhat liquidy. Should I add more sugar?